For much of 2016-2017 the people of Crafton Heights will be exploring the narratives around David as found in the books of Samuel and Chronicles. It is our hope and expectation that we will learn something about leadership, power, humility, grace, forgiveness, and service as we do so. On October 16, 2016 we considered the difficulties that arose when Saul’s jealousy overpowered his ability to stay centered in God’s Spirit. Our texts included I Samuel 18:1-16 and James 4:1-10. 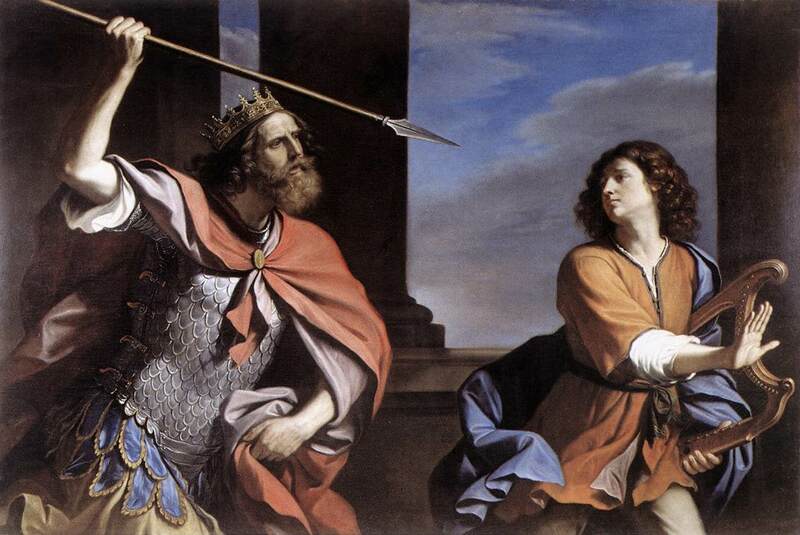 Saul is the recognized King of Israel. He lives in the palace, his face is on the money; he’s the “status quo”. His army has just defeated their perennial enemy, the Philistines. His stock ought to be on the rise. Except that young David, the insignificant shepherd boy and part-time lyre player, seems to be grabbing all the headlines for doing the kinds of things that kings ought to be doing (such as leading the army in the defeat of the Philistines). In our reading for today, we see David once more taking up residence at the palace, where he quickly becomes everyone’s darling. Chapter 18 tells us that two of Saul’s own children are smitten with David, and truth be told, Saul himself is crazy about this kid. That is the odd conundrum that has become Saul’s personal reality: when he sees David succeeding, it sends him catapulting to the edge of madness; the only thing that can bring him back from that edge is spending time in David’s presence. Yet as the headlines pour in, and as the feeds come through the social media, it’s clear that the Junior Staff Person is getting more publicity than the boss here. Saul is increasingly resentful of David, and the chants of the women outside the palace reveal the score: Saul has gained victory over thousands (yay! ), but David has triumphed over tens of thousands (YAY!!!). Saul, who wants more than anything to be king, is keeping score. He’s paying attention to who gets credit for what. He’s asking to be measured by these particular statistics, and he’s got to make sure that he comes out on top. 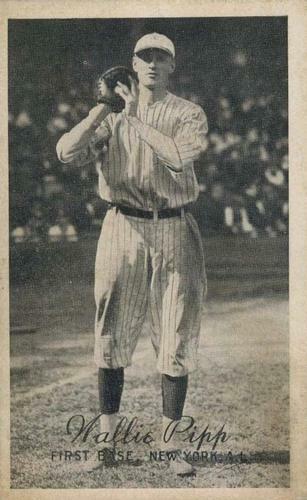 Compared to Saul, Wally Pipp’s problem was minor. He eventually signed on with the Cincinnatti Reds, and after he left the big leagues he was one of the first writers for Sports Illustrated before settling into a career in manufacturing. It could have been worse. And it was worse, for Saul. He had given up wanting to be measured in terms of his faithfulness to God, and instead wanted to be known for his own power and his own strength. The Lord was willing to let Saul be evaluated by whatever measure he chose, and as a result Saul is behaving as though it is all up to him. In fact, we’re told that the Spirit of the Lord had left Saul. David, whose position was precarious to say the least, responds to the situation by diving more deeply into God’s care for him. He trusts the Spirit of God that Saul had rejected, and as a result finds that he has the fruit of humility growing in his life. Like anyone else in Israel, David can see that he is serving a man who is less honorable, less noble, and less able than he is. And yet he continues to trust in God to sort everything out. 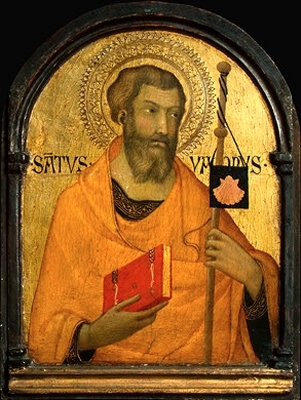 The first-century Christians to whom the Apostle James was writing seemed to face a situation that would have resonated with that of Saul and David. There is a cancer spreading throughout this community that claimed to be following Jesus. There are those in their midst who are acting with pride and supposing that they alone know all the answers. Increasingly, they are unwilling to listen to each other, unable to hear each other and reluctant to work together. The result, of course, is that there is bitterness and rivalry in the church. Jealousy and pettiness. James is appalled. “This is the church, for crying out loud,” the old Apostle bellows. “How can this be?” He accentuates his displeasure by comparing their behavior to murder and adultery. The solution, says James, is to cultivate the virtue of humility. Now, think about that for a moment. How, exactly, does one preach about humility? Since I do not have the authority of Scripture and the assurance of the inspiration of the Holy Spirit behind all of my words… what can I say about humility? How do you know if I’m humble? How do I know if I’m humble? Humility is a virtue, but how do we assess it? How do we cultivate it in our lives? Can we seek it out? Can we actively work on learning how to be humble? Fortunately for us, in addition to the example left by young David, there are some imperatives in the letter from James that will help us to become more humble, and therefore more Christ-like, in the days and weeks and months to come. It begins with taking stock of yourself and your situation. James says, “Submit yourself to God” and “draw near to God.” Place yourself in perspective, and ask God for the self-awareness to see yourself realistically. That’s really, really hard to do! So often, we are so acquainted with the way that we do things or the reasoning inside our own heads that we have no idea what is really true. This lack of self-awareness leads us to believing things about ourselves or others that are simply not true. For instance, I once found myself in a group that was about half African and half American. We were rehearsing a traditional African folk song that we would perform at some event when our director (a white American), stopped the rehearsal and began to scold us. He said, “Come on, people, I know these words are difficult, but we’ve got to pronounce them properly.” He then went on to tell us how we were to say the words. The Africans in the room, for whom this was their first language, raised a hand to correct him. One brave soul ventured, “Um, excuse me, sir but that’s not how we say that phrase…” African heads nodded. But the director, his nose stuck in his notes, simply said, “You’re not doing it right. Say it this way…” This man had no sense of even the possibility that he might have been mistaken, or that he was in the presence of those who were far more versed than he in the subtleties of their own language. Yet how often do we do that? I walk into a room and I want to take charge, I want my ideas to succeed, I want the way we’ve always done things to become the way we will also do things that I can’t imagine that there might be a better leader, a stronger idea, a more effective practice. I need to ask God to show me who and where I am in relationship to the situation at hand. I need to ask God to give me a solid sense of self-awareness and perspective. In my case, and in the passage at hand, we see that when that prayer is answered, the next step is confession. When I realize who I actually am compared to the One who created me and the things for which I have been created, the next step is to acknowledge that things are not as they ought to be, and often I am not who I ought to be. Lord, have mercy, Christ, have mercy. Lord, have mercy. I want to tell you that this is an empowering prayer. Before we even think about doing or saying anything in the name of Christ or of his church, we admit to ourselves and to each other that we are imperfect vessels who have to approach the work we’ve been given in a spirit of humility and mutual support and encouragement. So we begin with an honest assessment of ourselves, and that leads us to confession, which in turn brings us to the place wherein we can be deeply aware of the position we hold in God’s heart. When we strip away all pretense and self-aggrandizement, we can accept the fact that in spite of all our imperfections and sin, in spite of the ways that the world is so often not what it should be, God chooses to love us, and chooses to work through us, and chooses to use us in the world – not because of who we are, but because of who God is. You may remember Greg Louganis, an Olympic diver in the 1980’s. In the 1988 games, during the springboard event he missed one dive and hit the board with his head. Physicians stitched his cut, and he went on to win. In the platform diving he won the gold on his final performance with an incredibly difficult dive called a reverse three-and-a-half somersault tuck. It was a breathtaking finish that brought Americans to their feet. When Greg was just eleven, he became very frustrated at his diving performance in an early and important meet. Frances Louganis took her son aside and said, “I do not come to see you win. I come to see you dive. Just do your best. I will love you no matter what.” That unconditional love carried her son to forty-three national diving titles, six Pan-American gold medals, five world championships, one Olympic silver medal, and four Olympic gold medals. When we seek to learn who we are in God’s presence, and confess the ways that we have fallen short, we can find ourselves holding on to the unconditional love in which and for which God has created us. We can trust in the gifts that God has given us and seek to grow in service to God and our neighbor. Humility is not a false rejection of God’s gifts. To exaggerate the gifts we have by denying them may be as close to narcissism as we can get in this life. No, humility is the admission of God’s gifts to me and the acknowledgment that I have been given them for others. Humility is the total continuing surrender to God’s power in my life and in the lives of those around me. Saul looked at David’s gifts and then at his own, and was envious and angry. David looked at the ways in which he had been blessed and chose to act wisely. And when he acted wisely, good things happened. May we have the grace to do the same: acknowledge who we are and what we have received and seek to offer those gifts for the life of the world and the glory of God. Amen. This is good writing, good storytelling, making an ancient story relevant to a 21st century world. I find it refreshing, and I thought I should say so. In the prevailing culture, no matter how well you do something, you get criticized.